The Winnower | Picky Eaters: Do mosquitoes prefer the taste of people who smell &#39;better&#39;? Anyone who's spent any length of time in the tropics comes to develop an intimate relationship with Aedes aegypti, the domestic mosquito. Although everyone at some point has felt the red-raised itch of its bite, they seem to show their affection selectively. Spending summer nights in the Gulf of Aden, head to toe in the guest room with five of my cousins, it would always seem to be me who bore the brunt of the nightly assault. "She smells your sweet British blood,” they teased. Personally I always thought it was because they made me sleep by the window, but there may have been more truth in their words than I thought. It seems some of us really do smell more... appetising. The answers to why may come finally from the study ‘Evolution of mosquito preference for humans linked to an odorant receptor’ by Carolyn McBride et al which compared the ancestral species of mosquito, Aedes aegypti formosus and the domestic form Aedes aegypti, in their preference in meals. They focused on the evolution of domestic mosquito odour receptors in contrast to the ancestral forest subspecies, and the corresponding effect on food choice. Food choice in this case meaning the difference between your mother, your sister or the family guinea pig. Fig1.The two species of mosquito: The ancestral mosquito, Aedes aegypti formosus (left), and the domestic mosquito, Aedes aegypti (right). Photo by Carolyn McBride. Knowing why mosquitoes bite who they bite goes deeper than just saving people a few irritating and unsightly bumps. Found in tropical areas worldwide from South America to Australia, this particular species of mosquito is a common vector for diseases such as yellow fever, dengue fever, and Chikungunya. Yellow fever annually kills tens of thousands of people worldwide, while Dengue fever infects hundreds of millions and Chikungunya infection can lead to chronic pains lasting years after infection. Understanding how mosquitoes make food source selection could be instrumental in the battle against mosquito-borne illness and possibly have implications on other diseases carried by mosquitoes such as Malaria, one of the biggest killers in the undeveloped world today. “It was a really good evolutionary move. We provide the ideal lifestyle for mosquitoes. We always have water around for them to breed in, we are hairless and we live in large groups.”- Leslie Vosshall of Rockefeller University in New York. The researchers conducted a three-part experiment to understand the domestic mosquitos’ preference for human scent: forest and domestic mosquitoes were put into a box and results were recorded. Fig2.The three experiments. Photo by Carolyn McBride. 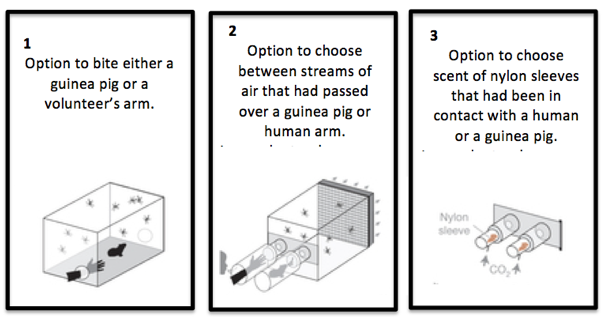 In all three cases, the domestic mosquito showed a strong preference for human scent, while the forest form primarily chose the guinea pig. Why Do We Taste So Good? The research suggests the odour- detecting gene, AaegOr4, is responsible for the domestic mosquito's preference for humans. The AaegOr4 gene codes for odour receptors in the mosquito's antennae sensitive to the chemical compound sulcatone, which is found in higher abundance in humans than other animals. They found this gene was more abundant in the domestic mosquito in comparison to the ancestral mosquito. However, it thought that sulcatone alone is not responsible for the attraction of mosquitos, and other variables may play a part. High levels of sulcatone aren't enough to attract Aedes. In fact, chickens have four times the amount of sulcatone in comparison to humans yet humans are still preferred. It seems that sensitivity to specific levels of sulcatone are used to identify humans as a food source rather than a simple attraction to the odour. For us the future remains positive. By understanding the evolution of human preference in Aedes aegypti we can look at ways to diminish its effects. While we may not be able to stop producing sulcatone as part of our body odour we may be able to mask or neutralize it in an effort to reduce mosquito's ability to locate humans as prey. If this works the human population could see a drastic drop in instances of yellow fever, dengue fever, and Chikugunya. However, history has proven the mosquito to be one of the most adaptable and resilient insects on Earth and it seems that they've singled us out as their favourite food source. Other research has shown that mosquitoes use skin microbes as part of the selection process and meal choice may be an even more complex process than we first thought. Hiding from them will be no task, but hopefully we can avoid a few bites along the way.